Bermuda Triangle® Triangles - A recipe from Savor California, the online showcase for extraordinary gourmet foods and beverages from California. 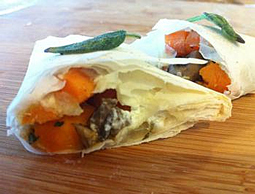 Savory vegetables and goat cheese encased in flaky phyllo doughto create an appealing and elegant appetizer. Heat a large pan with half a cup of the olive oil, add the mushrooms, sweet potato, onion and zucchini, and saute until tender. Add bacon and thyme, toss gently, and remove from heat. Combine melted butter with remaining olive oil. Brush the dough lightly with butter-oil mixture and working quickly, slide another sheet of dough on top of the first, brush it with butter/oil mixture and repeat until you have 4 layers total on top of each other. Cut the sheets of phyllo in half lengthwise to create long rectangular sheets. Facing the short end of each sheet, place 1/4 cup filling and a chunk of Bermuda Triangle on the end closest to you. Starting at the filling end, fold the phyllo sheet up on the diagonal line. Fold the triangle of phyllo over straight and then diagonally again. Continue folding first diagonally and then straight until you reach the end of the sheet. The filling should be completely enclosed. Repeat the process until all of the filling is used. Arrange completed triangles on a parchment lined baking sheet, seam sides down. Brush with butter-oil mixture and sprinkle with salt and pepper.